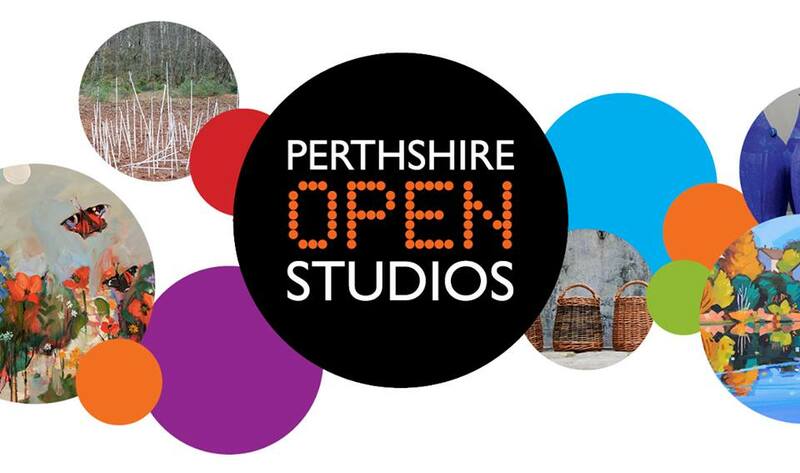 Perthshire Open Studios opens on Saturday 3rd September. The Green route runs through Comrie, starting at the Crieff end of the village with Jonathan Sainsbury in venue 98, St Serf’s church, where he is showing his BBC Countryfile Live stand, complete with live tame starling. Jonathan will be demonstrating as well as exhibiting work. Sheila Roberts at venue 100 is in Gould Cottage, Drummond Street. Sheila was an active member of Edinburgh Printmakers before moving to Comrie in 1995. Sheila specialises in soft ground etchings and her work made a big hit last year with visitors. Off Commercial Lane is venue 101, ‘That’s my Fleece’, a family business producing hand-done knitted wear. Over the bridge to Dalginross to venue 102, Ian Cuthbert, an architect graduate from Edinburgh who makes paintings and collages hinting at nature and landscape. Leave the village for Cultybraggan camp, for venue 103, Moka Pottery, the partnership of Mo and Kath Gibson-Kelly situated in the historic camp. Here the work is ceramics and art, in two different approaches, functional and decorative. Returning to the village, leaving in the opposite direction, by the Deil’s Cauldron restaurant for the Glen Lednock road, drive five miles up to Invergeldie to venue 104, for the work of photographer Jo Cound, inspired by nature and landscape. Keeping to the wildlife theme, come back to the village and take the road towards St Fillans, crossing the ancient Ross bridge for venue 105, Martin Ridley, wildlife and landscape artist. Martin recently entertained a large crowd in St Serf’s, with an illustrated talk about his work, his interest in swifts and conservation. Here is the opportunity to see a good selection of his original works and prints. Venue 106, back across the Ross bridge, on the road towards St Fillans is the studio of Louise McLaren, whose beautiful and delicate paper cuts and screen prints have attracted attention far beyond Comrie. Next comes venue 107, Vicky Cottrell at Glasdale, showing beautiful stained and fired glass, panels and jewellery. Proceeding towards St Fillans, The Old Dairy Studio is on the left at Tullybannocher, venue 108, shared by Liz Kemp and Madeline Davenport, both Fine Art graduates of Edinburgh. Liz brings the warmth of India to her work, while Madeline paints still lives, fishing boats, botanical hothouses. Tullybannocher is also the place to park for venue 109, Mid Tullybannocher, for two more well-known painters, Christine Ironside and Lin Patullo. Christine’s theme is ‘inner light’, many of her pictures are primary colours, while Lin paints in oil Mediterranean and Scottish scenes as well as scenes from childhood. Lastly, leaving the village behind, Margaret Evans at East Lodge Dunira is venue 110. Margaret teaches and specialises in pastel techniques.